Lotto 6aus49 may not be as lucrative as the biggest lotteries in the industry—or even designed to produce as much winners as possible like Eurojackpot—but it is definitely no slouch. It’s a straightforward, bi-weekly, rollover lottery that offers players 9 chances of winning per draw. Plus, a very decent 1 in 31 chance of winning anything. Sounds intriguing, right? Join me as I take a closer look at Lotto 6aus49 below! 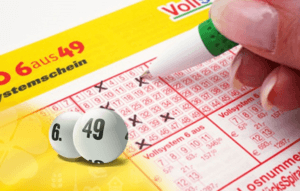 Launched all the way back in 1974, Lotto 6aus49 is operated by the Deutscher Lotto-und Totoblock (DLTB)—a collaboration composed of 16 lottery companies hailing from regions all over Germany. For the most part, it has maintained the same mechanics, until 2013 when changes to the format were made. Due to the changes, which ultimately resulted in the odds of winning improving significantly, Lotto 6aus49 became even more popular. Today, it is one of Germany’s most popular bi-weekly lotteries. Jackpots Rollover: Should no one win the jackpot in a draw, it will simply roll over to the following draw—making the resulting jackpot even bigger. Bi-Weekly: Draws are held every Wednesday and Saturday. Simple: Lotto 6aus49 is a very easy game to grasp. Both lotto newcomers and veterans alike will definitely appreciate the simplicity of the mechanics. Tax-Free: All prizes won in Lotto 6aus49 are 100% tax-free. Of course, if you live in another country, your local tax laws may apply. No Annuity: All prizes are paid out in full here. As such, don’t expect an annuity option to be offered to you. Nine Prize Tiers: Lotto 6aus49 offers nine chances for you to win in a draw. In fact, you can win by just matching 2 main numbers and the bonus number. How Does Lotto 6aus49 Work? Lotto 6aus49 works just like most lottery games out there. In other words, if you’re no stranger to lottery, this should feel familiar right off the bat. If you’re a newcomer, it’s pretty simple: you pick six main numbers from a selection pool of 1 to 49 (hence the 6aus49 name), plus a bonus number—known as the Superzahl—from a selection pool of 0 to 9. To win the jackpot, you must match all seven of your numbers (6 main plus 1 Superzahl). You can also win in the eight other prize tiers where the least numbers you need to match are 2 main numbers and the Superzahl. In cases where no one wins the jackpot, the prize fund simply rolls over to the next drawing for an even bigger payout. All Lotto 6aus49 prizes are tax-free and paid out as a lump sum, so if you win, you will be getting a much bigger prize compared to other lotteries. Of course, it might be a different story if you bought a ticket using a lottery agent service or if you live in another country. It will still be tax-free at the source, but take note that if you use a third-party service, additional fees may apply. Likewise, if you live in another country, you still have to deal with local tax laws, if any. Jackpots start at €1 million. Lottery funds benefit various good causes. Lotto 6aus49 pays out approximately €2 billion in prizes per year. If after 13 consecutive rollovers there is still no winner, the top prize will go to the 2nd prize tier winner instead. If there is still on winner in that tier, then the next tier will receive it, and so on. Now is as good a time as any to play Lotto 6aus49! While not the most lucrative lottery in the industry, Germany’s Lotto 6aus49 still has a lot going for it. On top of simple game mechanics, it also offers 9 chances (i.e. tiers) for you to win. Even better, it’s also a rollover lottery, which means that the jackpot will only grow larger should no winner come forward. Prize are also tax-free and paid out as a lump sum. What’s not to like?